Stemming from science and mathematics, art and architecture, as well as nature, visual patterns present themselves in our daily lives in the most unexpected places. Whether they come in the shape of dots or stripes; fractals or spirals; waves or dunes; symmetry or chaos, we appreciate their aesthetic value in all their glorious shapes and forms. 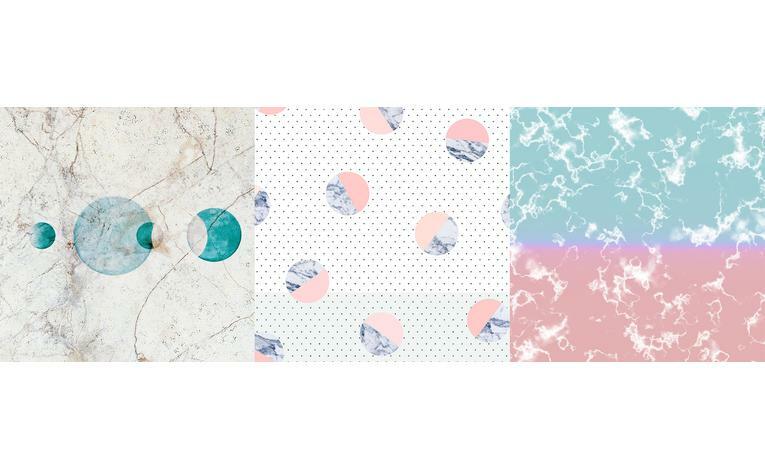 Fuelled by our curiosity, we decided to venture to the core of two trending patterns: marble and terrazzo. From ancient Greek quarries to Michelangelo’s David, the Taj Mahal to the US Supreme Court, marble has been a sought-after material in art and architecture for centuries. Impressive for its sheer stability and extraordinary beauty, it has long been a symbol of affluence and prestige. In recent years, we’ve witnessed a rise in the use of marble as an aesthetic device in fashion and interiors. Be it on catwalks, tableware, or furniture, we’re increasingly seeing it used both as a raw material and visual motif. 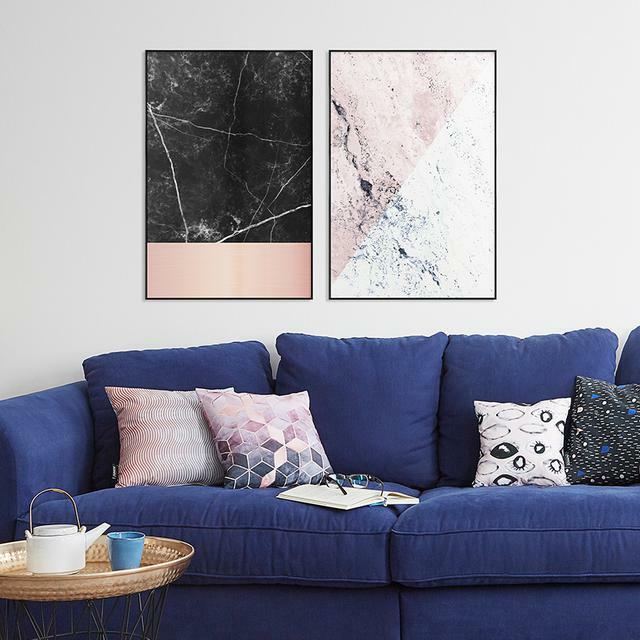 In the context of our pattern artworks, marbled textures, paintings, and graphic designs are represented on everything from premium prints to bedding and notebooks, inspiring us to dig a little deeper into its overarching role in the art world. The word ‘marble’ has its roots in the Greek word ‘marmaros’, meaning ‘white, shining stone’—the result of metamorphosis when limestone in the earth is exposed to high temperatures and pressures. This phenomenon occurs on such a tremendous scale that millions of tons of marble are mined globally each year. Scientifically, the magnificent array of marble types and colours is a result of vastly different mineral compositions, such as quartz and clay minerals, arising from the time of recrystallization across the planet—Wunsiedel marble (mined in Bavaria, Germany) has a strong greyish tinge to it; Etowah marble, with its black and white streaks, is sourced from the state of Georgia where it ranges from pale and peachy to bright salmon in colour; Makrana marble (mined in Rajasthan, India) is characterised by its soft, ebony shades. White marble is won from the purest limestone. In the classical age, it was favoured by sculptors and architects for its softness as a material and near-to impeccable sheen. In recent years, however, we’ve seen a significant rise in designs blogs and magazines towards more unusual, darker-coloured marbles, such as Ashford black marble from England and a deep, green-tinged marble from Ireland, often referred to as Serpentine marble. From turquoise tints to midnight blues, burnt rosés to slate-shaded greys, our artists’ work celebrates marble for its diversity. And many choose to pair the pattern texture with hard-lined geometric shapes. 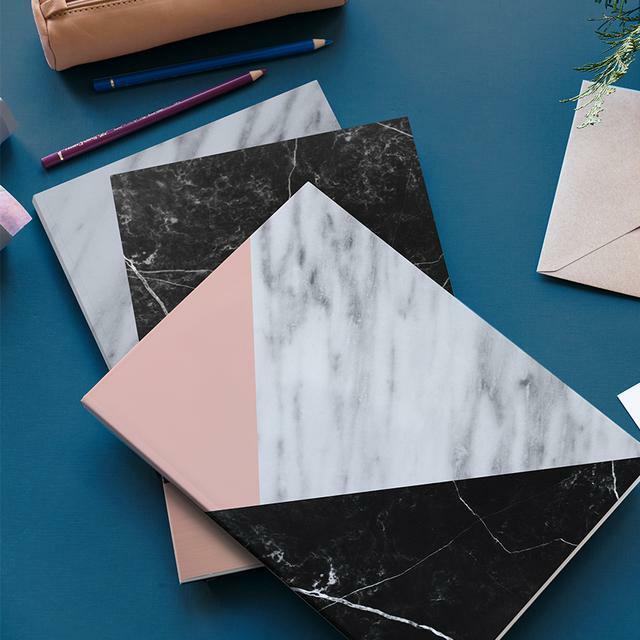 An excellent example for this can be found in our stationery category, where cafelab’s notebooks pretty much takes the marble cake when it comes to glamorous, yet distinctly modern designs. Looking back at history, marble art was reserved for the royal and affluent. How lucky we are to live in a time when one of nature’s most unique and mesmerizing rocks is readily available to be enjoyed by all. Archaeologists and historians have traced terrazzo as far back in time as Neolithic Turkey and Ancient Egypt. Nevertheless, the iconic form that is finding its way back onto the modern design map is rooted in 15th century Venetian flooring. So how did a construction material, favoured for its economical production and durability, emerge as one of our most-favoured patterns on acrylic glass? The word ‘terrazzo’ means ‘terrace’ in Italian. 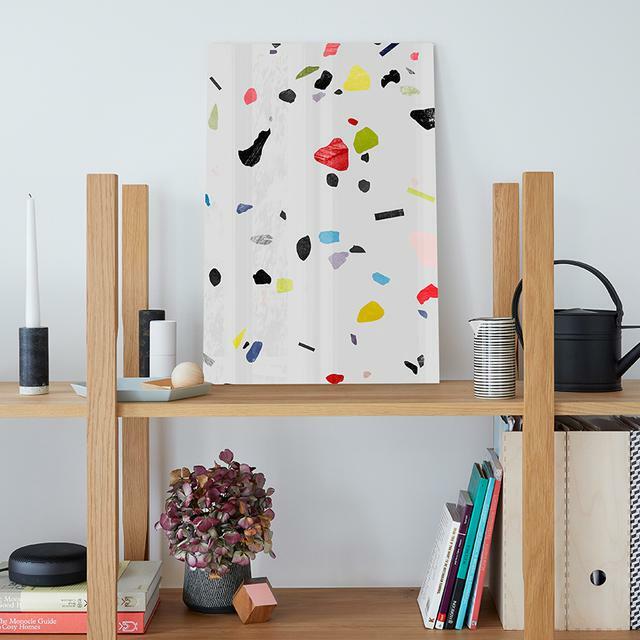 Unbeknownst to many, terrazzo is considered one of the very first moves towards ‘green’ architecture as it came about as a means of upcycling a waste product: discarded marble. An ingenious invention, it was born out of Italian mosaic workers’ frustrations over the many cuts of the precious material they were forced to throw away. Initially, chips and oddly shaped pieces of marble were set in concrete, which was then polished to bring forth the myriad of colours. It was soon discovered that applying a coat of goats’ milk to the polished floor truly allowed the marble to shine. Terrazzo’s popularity began to rise as it made its way across the Atlantic with an influx of Italian immigrants to the United States in the 19th and 20th centuries. The skilled Italian terrazzo workers in New York City became so sought after, they were coined the ‘aristocracy’ of craftsmen. In the early 1920s, the invention of the mechanical grinder made terrazzo readily available for large-scale projects and corporations. With its timely arrival in the midst of the art déco and modernist eras, where colourful geometry and curved architecture reigned, terrazzo quickly rose to fame. Unsurprisingly, it didn’t take long for it to journey back to its roots on the other side of the Atlantic. Over the course of a century, terrazzo floorings have evolved to contain an array of materials, including quartz, glass, metals, granite, and synthetic elements. 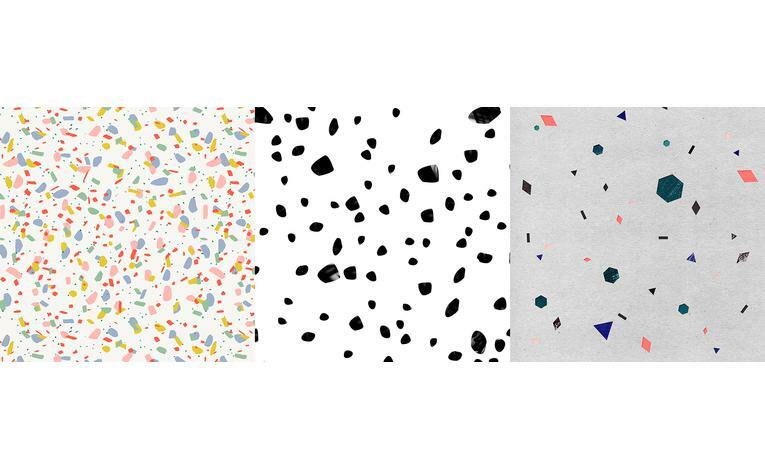 Though terrazzo is still most commonly used as a pattern in architecture, in recent years we’ve witnessed strong parallels to that of the rise of marble in art and home décor, spanning everything from large-scale wallpaper to entire kitchen cabinet fronts. 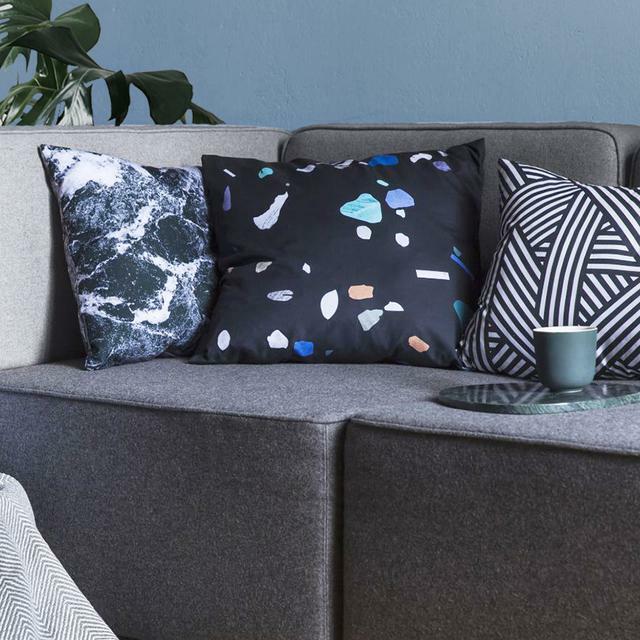 Looking for comparisons in our own catalogue, we were delighted to discover that in addition to its popularity as a pattern on posters, terrazzo-printed cushions are increasingly finding their way to beds and sofas across Europe. Because of the busy visual nature of terrazzo surfaces, we recommend starting small and testing out your taste for terrazzo on more petite elements, before plastering entire rooms or pouring your own floors. Its beauty as a pattern lies in the individuality of each oddly-shaped splash of colour: no two pieces are the same. At the end of the day, whether you choose to go all-in with the marble look or tiptoe your way towards terrazzo, one thing is certain—place your trust in these patterns and you can be sure you’re adding a timeless and unquestionably elegant touch to your home.